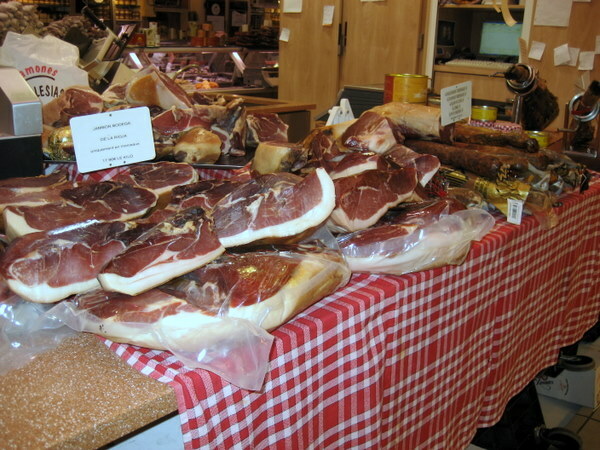 The markets – Run-of-the-mill supermarkets, open-air/farmers markets, and covered markets (marches couverts). Focus on quality – This was apparent in many things, but most noticeable in food. Strawberries – Absolutely the most amazing strawberries I’ve ever tasted. That is saying a LOT considering how spoiled I’ve been with Oregon strawberries. French strawberries are small, delicate, and taste like strawberry flowers. Ice cream at every turn. 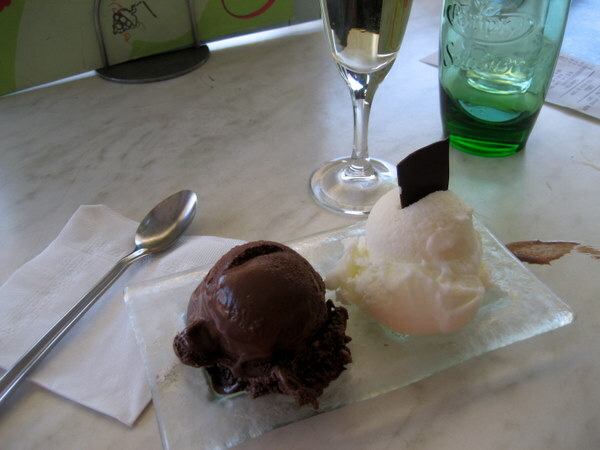 There is a big ice cream culture in Toulouse. I’ve never seen so many ice cream shops per capita anywhere. Skinny French women walk around slurping ice cream from gigantic waffle cones. Go figure. I think they don’t eat anything else. Old buildings made of stone. French: access to a 24-hour learning lab. Fries with mustard, best fried in duck fat. Everything being so close in the city. Multilingualism – F rom the clerks at the grocery store to the clothing store clerks, most young people had at least a second language. Popular second languages were English, Spanish, and German. Shutters – The local style here is wooden shutters on all windows. They are open in the morning and night, and closed during the day to keep out the sun. A popular color is pale blue. 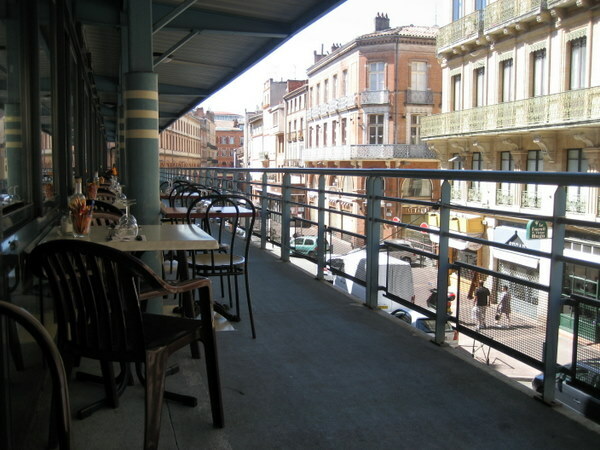 Cafe culture – People hang out at cafes most of the day, after waking up at 10, that is. Generally speaking, people don’t seem to eat out, they drink instead. I think eating in restaurants is expensive here, so people go out and drink coffee or wine with their friends instead. Cafes and bars are packed much of the time. It helped that the whole country was on vacation for July. 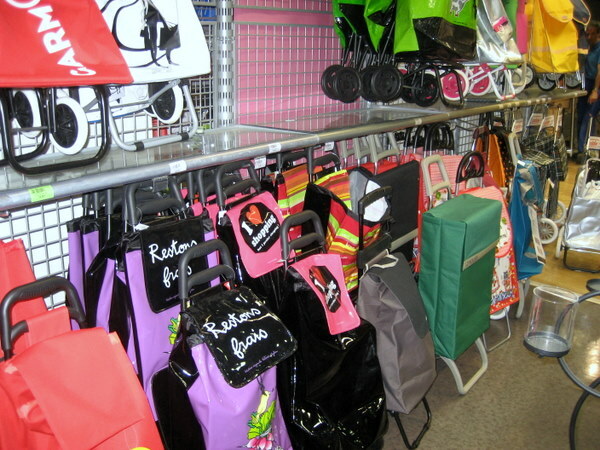 July sales – The government mandates that all stores have sales in July. It’s a trip! I think it’s because everyone is on vacation and maybe they want to stimulate the economy during a slow time. You walk around Toulouse and there are “SOLDES” signs in every shop window. Very cool. 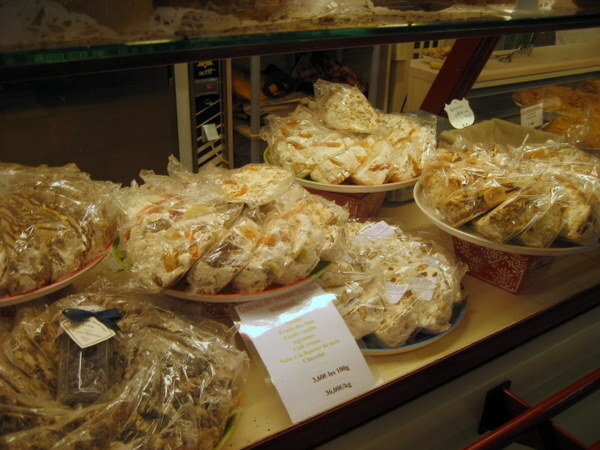 Dairy products – I’ve never seen such a huge variety of dairy products. 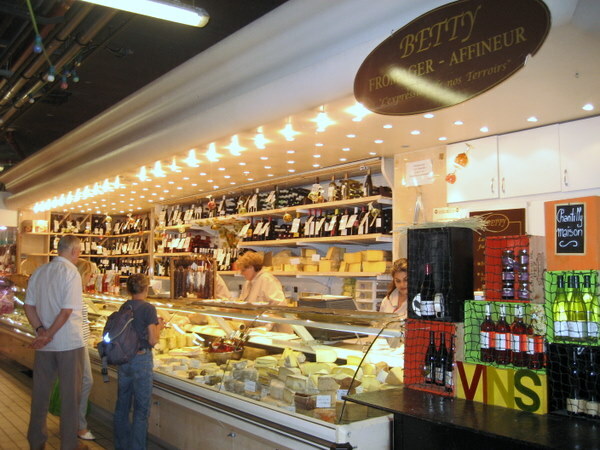 From the corner grocery to the gourmet markets in the city, the French love dairy products! Gajillions of yogurt flavors and styles, butters, clotted creams, semi-whipped creams, milks, soft cheeses, hard cheeses, cheeses from ewes, goats, cows, and anything else you could possibly make cheese from, creme brulees in to-go cartons, etc. It’s a dairy lover’s paradise. Bisous – The French double-cheek kisses for greeting and departing. Gazpacho in a carton (which is pretty good). Kir – Toulouse had an interesting violet kir (one of the city’s nicknames is the City of Violets), but my favorite was peach (peche). Beets at the market being sold roasted. I never saw a beet for sale that was not already roasted. Homeless people – There were some homeless people in Toulouse, but not anywhere near our numbers. Poverty – In the countryside and the city, they don’t have the obvious extremes that we do. I kept asking if I was just unable to “see” it with my American eyes, but I had to finally conclude that the extremes just aren’t as extreme as they are in the States. 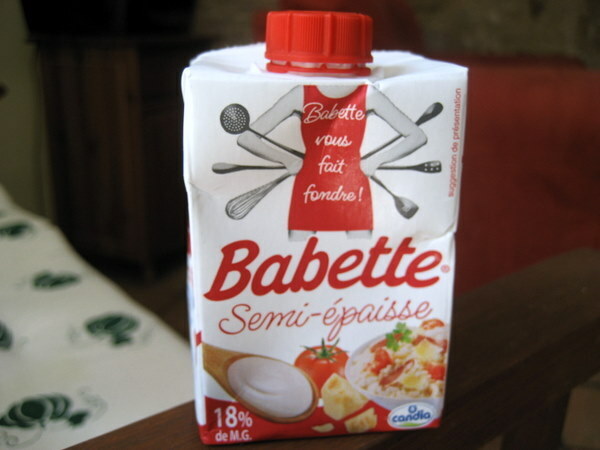 Babette, j'taime! This is SEMI-WHIPPED CREAM in a CARTON! Ridiculous. Amazing with strawberries. Average breakfast. 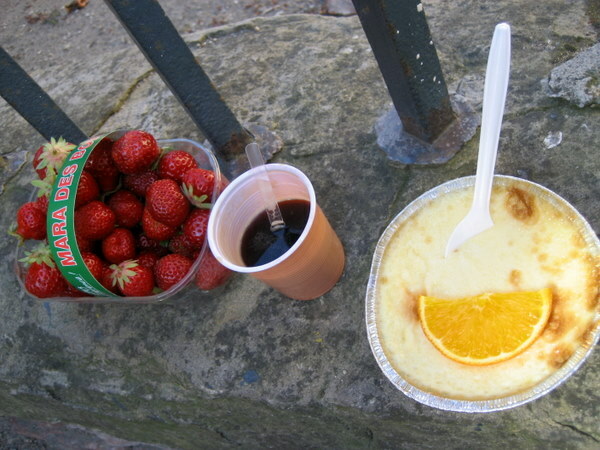 This was the day I went to the market at St Sernin. Average lunch. I had just stumbled upon an open-air antique book market, as you do! Bought DL a French cookbook there. 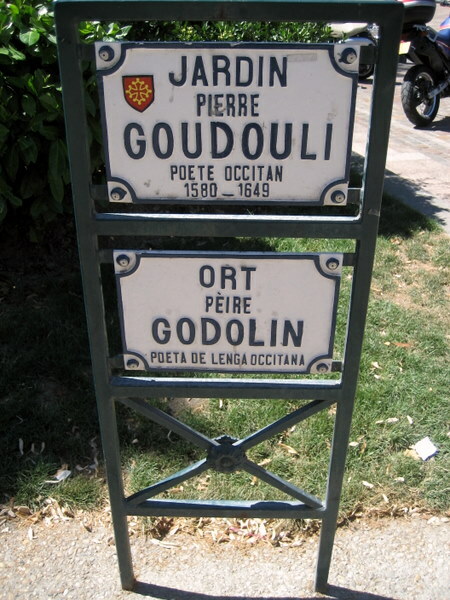 The streets and parks have these signs that are in French (top) and Oc, the regional native language (bottom). There are a lot of Oc books and they teach it now (again) in schools to children. 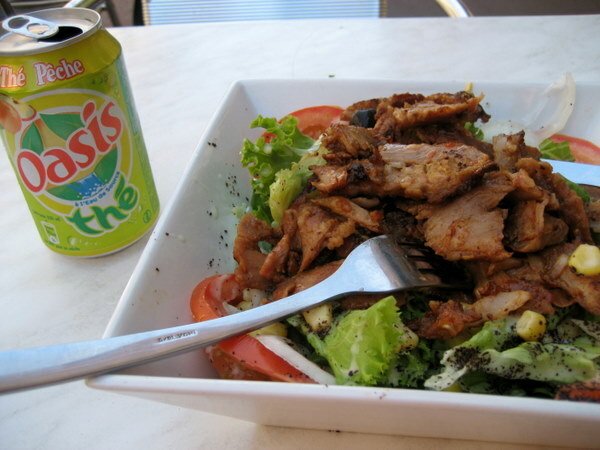 Lunch when I got tired of French food: kebab! I was somewhat verbally accosted by an aggressive panhandler while eating this at an outdoor table. The kebab shop owners jumped to my defense. All I understood was "THIS LADY DOESN'T EVEN SPEAK FRENCH!!!" It's sadly true. I had no idea what the guy was saying to me. Do you see why one might get sick of foie gras? THIS is the portion size. I ate so little of this that the proprietress asked me if anything was wrong with it. I struggled to explain it was one of the few things without wheat on the menu, but that I'd been eating way too much foie gras already this week. She was very gracious. We ended up talking about her trip to San Francisco. I understood "Golden Gate" anyway. Ice cream probably deserves its own post, but alas. This was my favorite: dark chocolate and jasmine by Phillippe Faur at the Florida Room on the Place du Cap. My feet are bloody stumps after walking around Toulouse for 11 hours straight today. Wow. Not even sure where to start except to say that this is an awesome city and I hope to come back as soon as possible. It’s a small city with narrow streets lined with four- to six-story, old apartment buildings featuring the typical wooden shutters, and with shops on the street level. People drive like maniacs through the tight streets where many people are walking because the sidewalks are so narrow. I’ve noticed that French women really YELL harshly at their children when they accidentally step into the street, and I can understand why. There’s no way anyone would survive getting hit by a car here, child or adult. The view from my table one day at lunch. 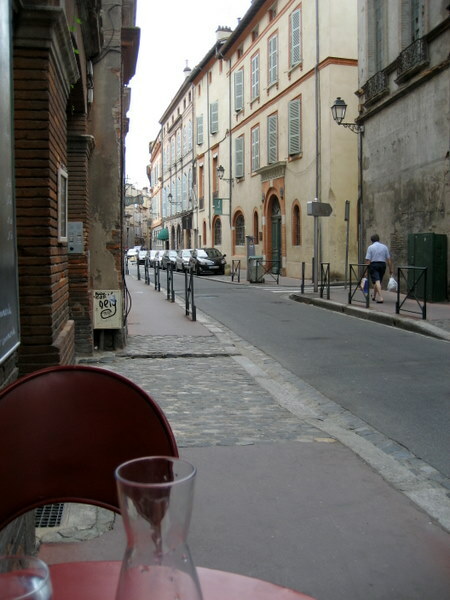 This is a typical street in central Toulouse. I started the day at the marche couvert, also known as the Victor Hugo market. It’s actually inside a big parking structure. 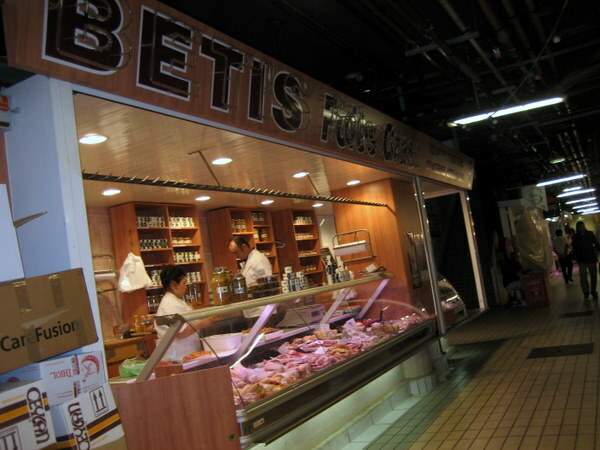 The ground floor contains the market, which is a huge space jammed with vendors of all kinds (fish, sausage, cheese, bakeries, horse meat, beef, prepared food, and cafes/bars), while the outside of the building is lined with fresh vegetable and fruit vendors. Inside on the second floor are restaurants. Inside the market. The symbol on the floor is the Occitan regional symbol. The foie gras shop (!!) at the Victor Hugo market. The charcuterie stalls were truly over the top. This is just a SMALL example. 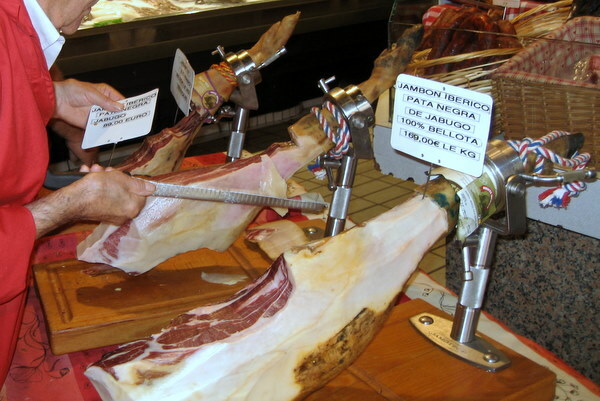 This is how you buy your charcuterie at the market: a guy slices off some pieces for you. Those are the pig's feet in the clamps. I ate lunch at one of the market restaurants one day, on the second level. This was my view. Getting there early was a good idea because it was mostly older people doing their shopping. As time wore on, the aisles clogged with looky-loos who stood gawking in annoying, traffic-jamming clumps. I’ve noticed that French women use these fun rolling carts for their shopping, much like what I recall women using in Manhattan when I went to school there. It’s a small city, so people walk everywhere. A display of the rolling grocery carts at a Target-like store. I made a couple of laps just to get the lay of the land and observe how the Romans do. Mostly I was trying to get breakfast for myself, but I wasn’t sure where to eat anything after I purchased it. The restaurants upstairs were still closed at 10 a.m. I noticed that people were standing at the cafe bars eating things they’d bought at other stands, so I opted for that as well. I bought some Basque cheese, a frittata, and what turned out to be lemon-flavored clotted cream from ewes (! ), but which I thought was yogurt. Lesson learned. I figured I’d have a heart attack before lunch, but fortunately, that didn’t happen. It was DELICIOUS and would have been worth at least a minor myocardial disturbance. Betty Fromagerie, where I got the ewe clotted cream. Truly an awesome shop, but there were several fromageries like this inside the market. And there was another Betty location across the street. An interesting tidbit: the sign at the fromagerie where I bought the clotted cream made a big deal of the ewe cream finally arriving. So I’m guessing there’s a season for clotted cream from ewes and I was lucky enough to hit it. Yea! At the cafe/bar, I ordered a grand creme, which is basically a latte here in the city (in the countryside, grand cremes seemed much, much stronger). I stood and ate my breakfast while watching two guys across from me split a bottle of rose for breakfast. Earlier I had noticed SEVERAL people drinking wine and beer at a few different bars, men and women. No one else seemed to think this was strange so early in the morning. The French love their nougat, and I'm converted. These are piles of several different flavors. Help! My next mission: a taste-off of the bazillion ice cream shops all over town. I’m pretty sure life couldn’t get any better. The town filled today for Bastille Day festivities that started with a somewhat solemn ceremony in the lower square. 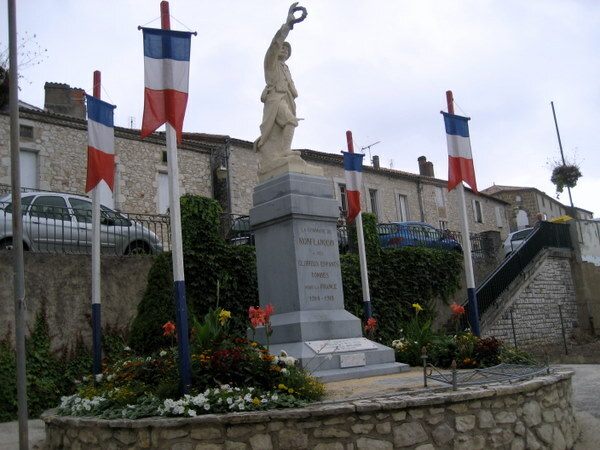 The statue there commemorating the young people lost in the first World War was hung with several French flags. Around 11 a.m., a small group began to gather. 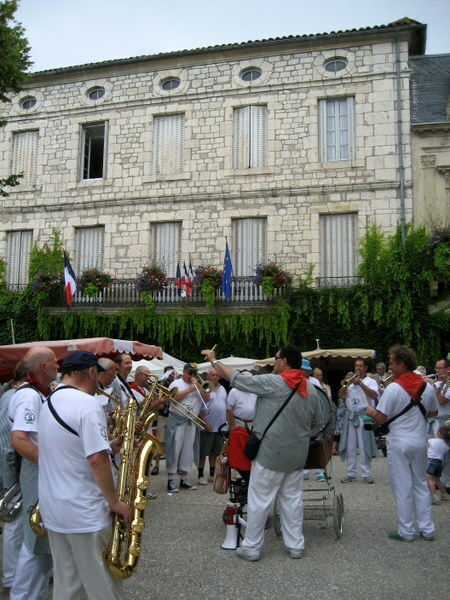 There was a band, Legionnaires, townspeople, and the current and former mayors of Monflanquin. The band played a song I didn’t recognize while the main flag was raised. Then the mayors delivered a giant bouquet of flowers to the base of the statue and the band played “La Marsellaise” (the French national anthem). Here they do not have the custom of placing their hands over their hearts or of singing the words, which surprised me, especially considering what I saw an hour later from the same crowd. The mayor gave a small speech, some of which I caught, about the people who died for France during the War. The crowd was quiet and simply listened. The band played another song. There was never any clapping or expressions of joy. It struck me as not quite somber, but serious. From that seriousness, we need a shopping break, naturally. 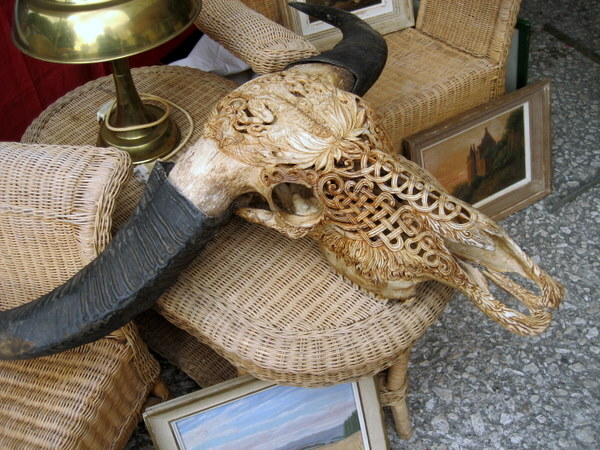 Today was the second and final day of the antiques brocantes, the antiques flea market. Around noon, we could hear the band playing in the corner of the square, “When the Saints Go Marching In.” It occurred to me that that is probably a French song, though as an American, of course I think of it as a New Orleans song. The band slowly made their way through the square while playing. 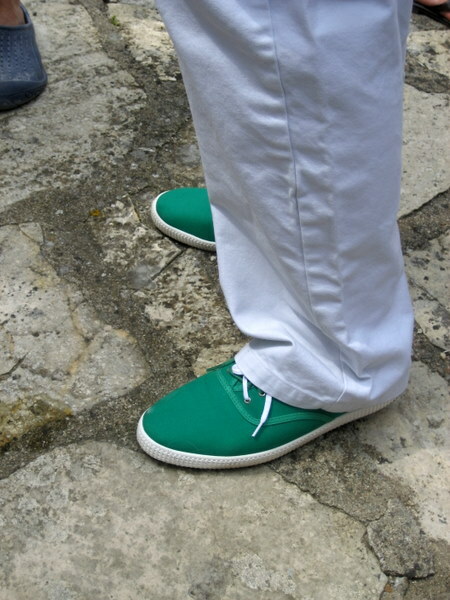 The band is called Les Verts a Pieds of Monflanquin (The Green Feet). I’m not sure why they are called this. Their bandleader is a hoot! He plays a drum that he pushes around in a bassinette with a black rubber rat on the top. We fell in line behind them as they marched into the interior terrace of City Hall. The band playing in front of city hall. Marching into the mayor's courtyard. Once inside, everyone crowded in and the mayor gave another speech, only this time, it was a lot more festive. 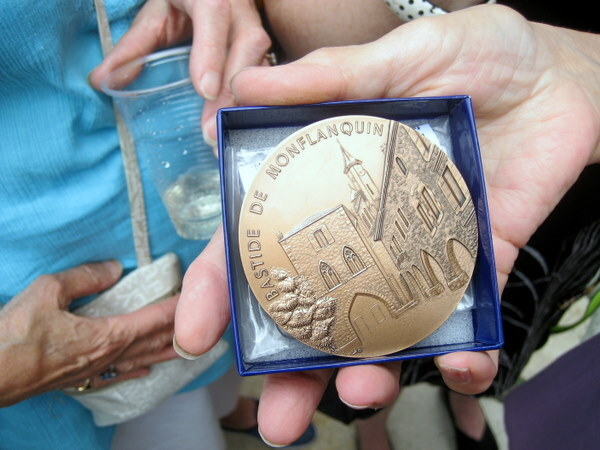 The mayor bestowed upon a few lucky Monflanquinoise (his word) the official medal of the village, which I assumed was like receiving the key to the city back home. And here’s the best part! One of the recipients’ claim to fame? THE SCRABBLE CHAMPION OF THE WORLD!!! I nearly died with joy (velvet booties!) I was so overwhelmed by this brush with verbal/literary genius! Other medal recipients included the national boxing champ of teenagers, the local soccer team who won their regional championship, and a local fireman who had done a lot of community service (I couldn’t really follow all of this, frankly). In the evening, we had dinner with F, a grand dame of the village who is completely charming and an incredible hostess. She served us foie gras from an awesome foie gras serving platter decorated with ducks (!! ), leg of duck, haricot verts, strawberries and ice cream, and wine with every course. It was quite luxurious por moi. 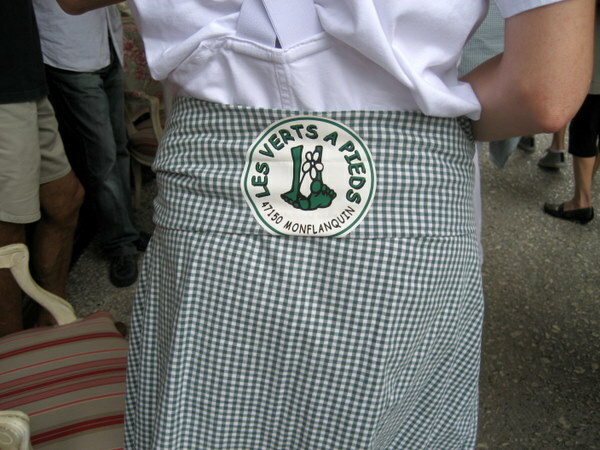 I also got the chance to butcher the French language with several locals and their children throughout the meal. I feel extremely lucky to have been invited to such a dinner with a very authentic family for a holiday meal. I minded my manners by not whipping out my camera and taking a shot of every course. At one point another guest (a native French speaker) asked us to explain the meaning of “laid back,” which was entertaining. It’s hard to explain things when you don’t have much French to begin with. “Relaxed,” “Californian,” and “surfer,” were the best we could do with “laid back.” They were also quite taken with an American film called “Bagdad Cafe,” which neither of us could remember. 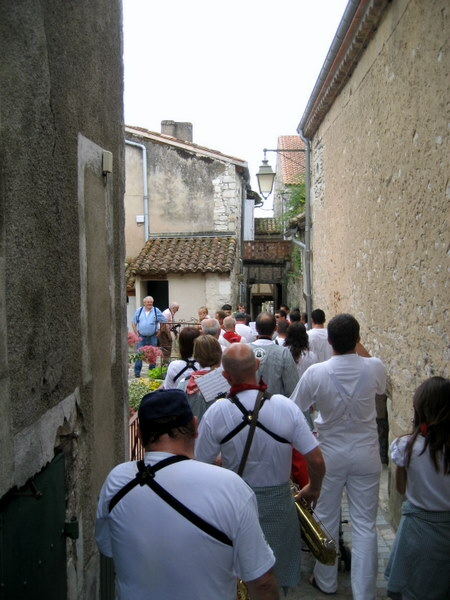 Afterward, we followed the horde over to the edge of the bastide to see the fireworks. I’d say there were about 500 people there. The fireworks were set off over the cemetery, but because the town is on a hill, they seemed to pop right in your face, which was kind of crazy and cool. Then everyone filed back into the square where a band played and people danced. All ages are out enjoying the night while the band plays medleys of Abba, French songs I don’t know, and other songs in English that it’s hard for me to understand. It was a bit like being at a wedding. Now I’m back at the house and can hear the crowd and the band in the square. GB says this will go on until late tonight. It’s already past midnight, so I’m in for a long one. Pas d’problem! I’ve got my French to study, and I need it. 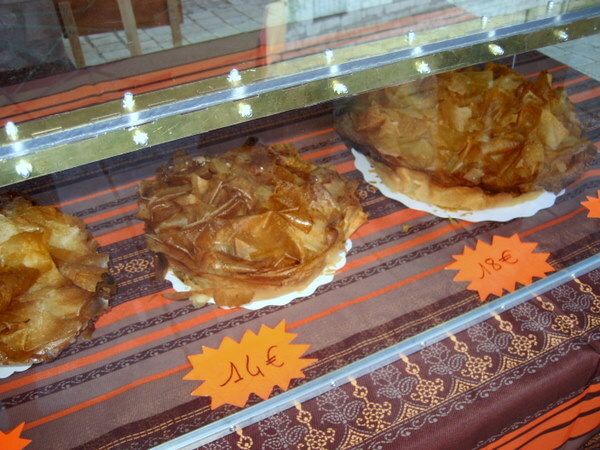 A local pastry specialty called Le Torchiere, which looked like pastry layers with an apple layer base, and always sold at the farmers markets. Thursday morning: a large farmers market in the central square with very advanced vendors, including several cheese vendors, sausage vendors, wine merchants, and fish vendors. When I say “several,” I mean about 3-4 places. The fish vendor literally has 2-3 refrigerated cases of fish, the kind of cases you’d see at a supermarket, not Igloo coolers. Thursday evening (summer only): the “gourmet” market. Also in the town square and comprised of some fruit and veg vendors, and many more hot food vendors. That’s where I got the french fries in duck fat. Mmmmm! 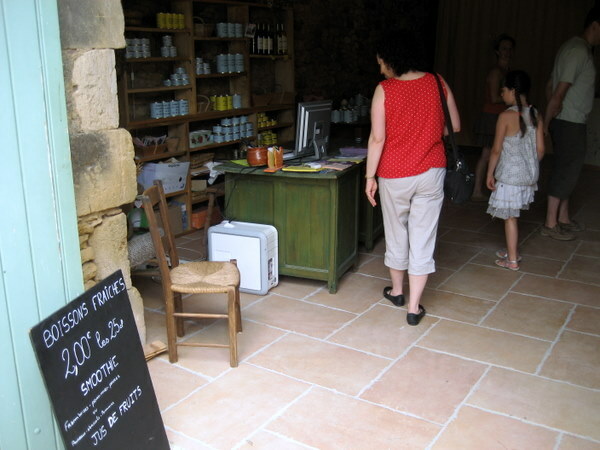 Sunday morning: a small farmers market on the south side of the bastide. Between these vendors and the butcher and local patisserie, you’d have great makings for Sunday dinner and certainly not starve until Thursday came around again. And, of course, there is the Casino super-marche just outside the village to tide you over. Really, it’s amazing. I’ve eaten extremely well this week on our farmers market food and I haven’t even cooked anything, just assembled, which is my favorite kind of cooking/eating, even back home. 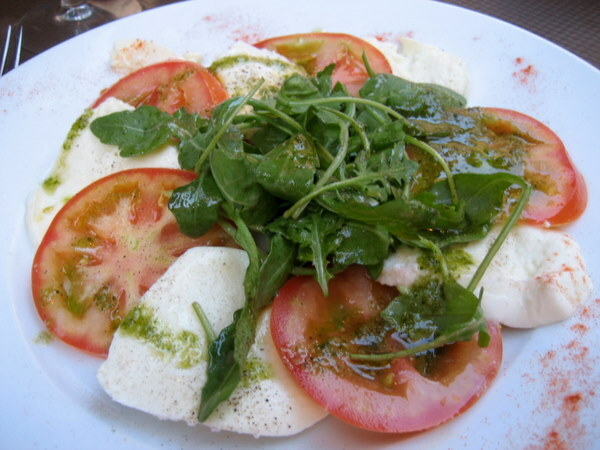 Meals are like this: sliced melon, a little sausage, cheese, and a simple salad with cukes, tomatoes, and olives. Oh, and, bien sur, a glass of wine (I’m in France, after all). Speaking of wine, I’ve never seen or tasted such great vino for so cheap. There is just a TON of wine here everywhere you look. The wine section at Casino? Over the top! And at all the farmers markets, there are also local wine vendors, average price 3 euros a bottle. The local wine is cahors, which moi actually doesn’t care much for, unfortunately. A village fried told me to “keep trying!” with it and eventually I’ll acquire the taste. Ha! If Americans had this easy access to such high quality food twice a week, I’d have a hard time not seeing our obesity problem improving dramatically. And that’s the thing…it IS of a quality that we don’t have in our small towns and many cities, and at very affordable prices (I’m now convinced that “Everything is expensive in Europe” is a complete myth). 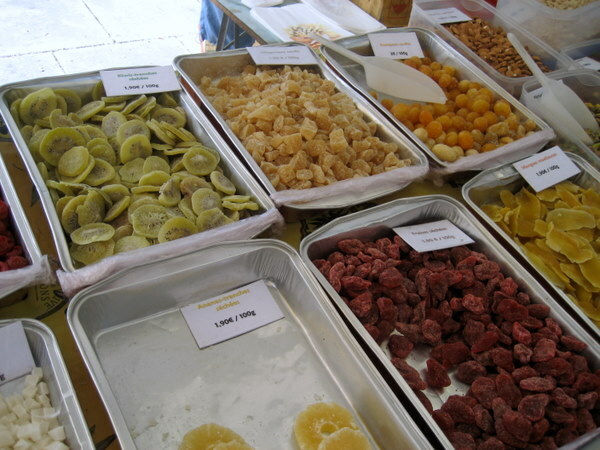 The dried-sugared fruit stand. Kumquats are my new favorite. The kiwis were disappointing. 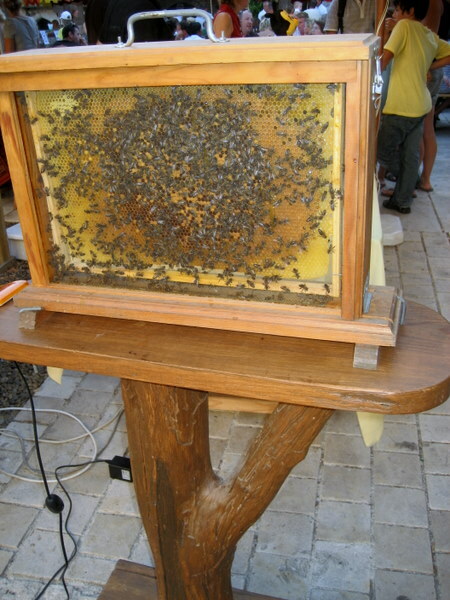 This was at a stand that sold honey and all manner of bee products. Live bees! Today there was a big antiques fair in the village square. When I say antiques, I really mean antiques, and not just a lot of junk. 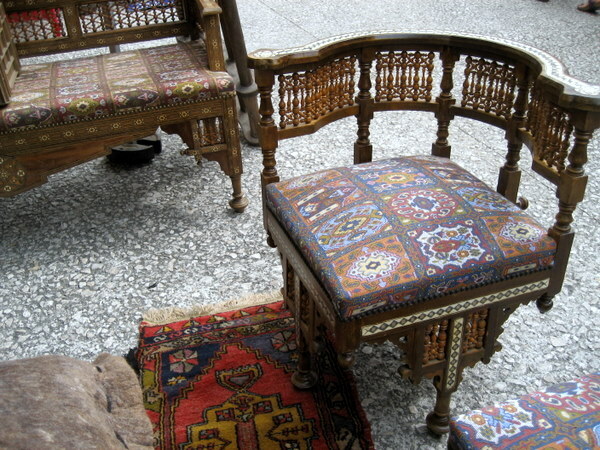 Think gorgeous armoires, velvet-covered chairs, silver service sets up the wazoo, beaucoup de linens authentique, and then slightly more mundane things like fantastic jewelry, plates, old books and postcards, and rugs. Sadly, there was no food. But we made up for that by having lunch with J in the square. Beaucoup sadly, I could hardly understand a word he said. Something about tourism in the village. But he was incredibly sweet to even accept our lunch offer so that I could practice French with him. It turned out that he practiced English instead. I’ve spent most of my time in France so far shopping in open-air markets. No complaints here. The corner of the square during the antiques market. 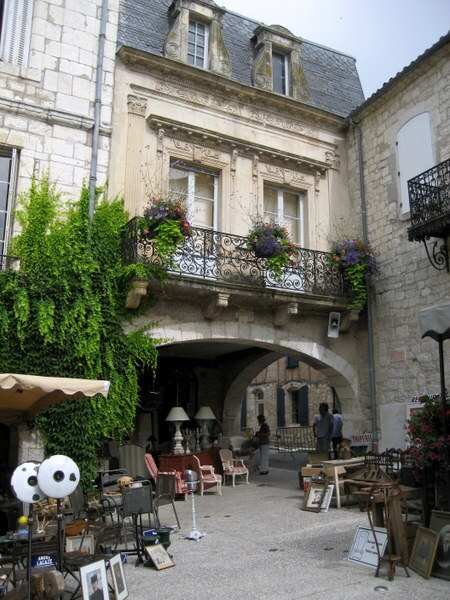 We decided to go to Agen to visit The Prune Store. 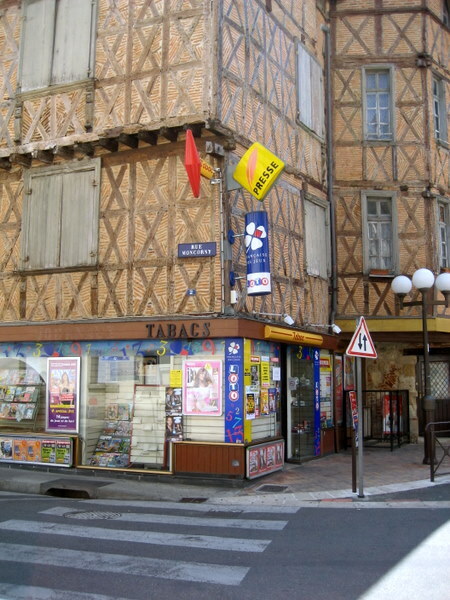 Agen is the prune capital of France, and the locals are very proud of this. There are plum trees everywhere in the southwest countryside, and plums and prunes are pretty much everywhere in the farmers markets, super-marches, and shoppes. There are prunes painted on the sides of buildings, teapots, teacups, thimbles, plates, placemats, napkins, aprons, etc. I wouldn’t be surprised if in the olden days prunes were traded as currency. At the prune store I tasted the cocoa-covered prunes and they were good, but I didn’t go prunes for them. However, most people really seem to love this delicacy here. I ended up buying some nougat instead that was fantastic. It felt a bit wrong, but oh well. Next stop, my first marche couvert (covered market). 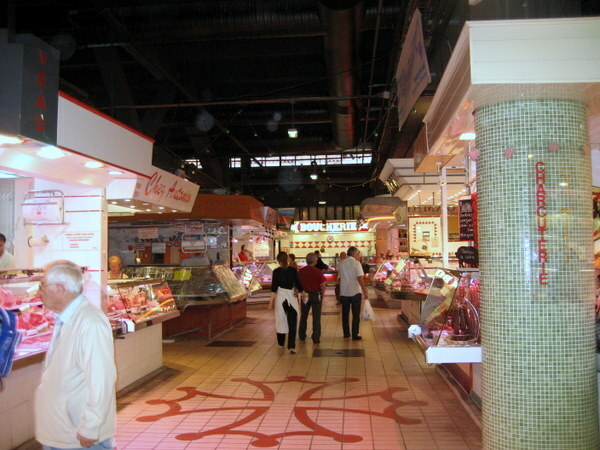 The covered markets are basically large supermarkets, but not at all like the Casino super-marche in Monflanquin. The covered markets are way, way better. They are more like an indoor farmers market with individual vendors collected together under one roof, like a mall filled only with food vendors, or, like paradise. There are fish vendors, cheese vendors, meat vendors, and so on. There are also bars inside the covered markets, and in Agen, people were drinking at them, at lunchtime. LOVE this country! We had to take a break from the overwhelm, so we went back to the square and had a kir while people-watching. Kir is my new drink. It’s really nice in the hot weather here and locals seem to love it. After that we went to the African masks exhibit at the musee (sadly, I could not find a link to this). The building itself was quite something, an old church. I think people here accept the oldness of things as part of life, in the same way I took the Golden Gate Bridge and Alcatraz for granted growing up in the Bay Area. They just weren’t on my radar outside of second-grade field trips. On our way back to the car, we heard cars honking in the distance: a wedding, and they were coming our way! It’s quite a site to see a line of cars driving fast down these narrow European streets, honking their horns like mad. Many were decorated with wedding paper and streamers and waving at people. I got a little video of that but it doesn’t quite convey how fun it was to watch. Then back to Monflanquin, navigating the country roads in our Ford diesel stick-shift, a car you can’t even get in the States. Oh yeah, and a big accident involving a horse trailer out in the countryside because people are truly crazy drivers here. 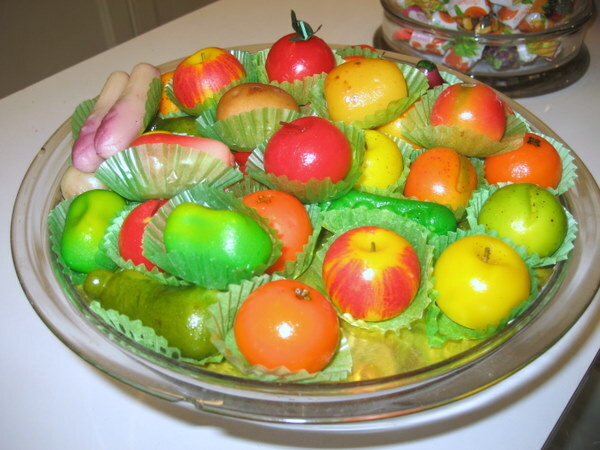 Marzipan candies in fruit and vegetable shapes (at the prune store). Cool building in Agen. The red sign is a symbol for tobacco (so get your smokes here). 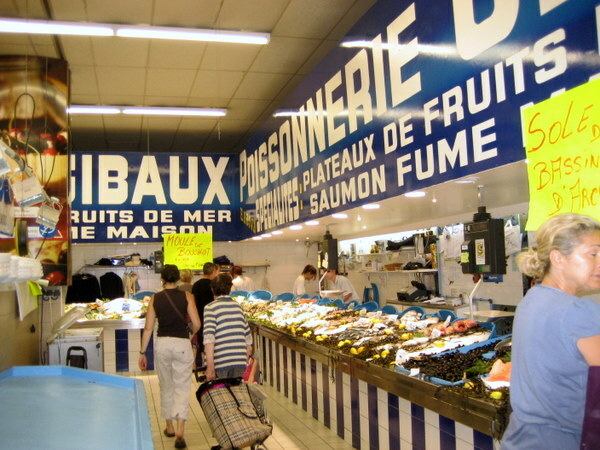 The fishmonger in Agen's covered market. Most people walk around with those stroller things and cart home their groceries that way (walking home, of course). 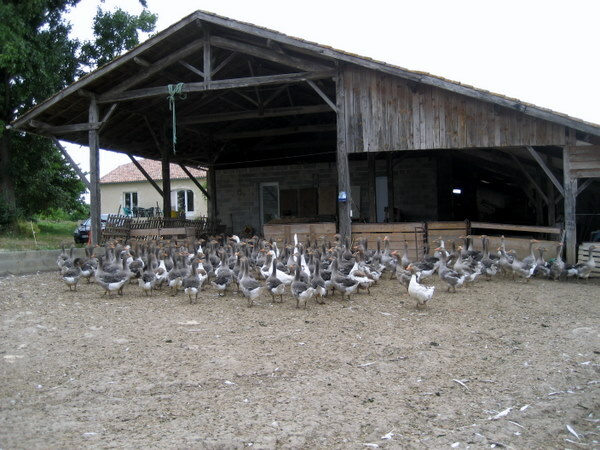 Today we went to the local foie gras farm. GB met the farmer at the Thursday market where she sells her foie gras every week. She lives about two miles down the road from Monflanquin and gives a tour on Monday mornings. Sign us up! Of course we went. 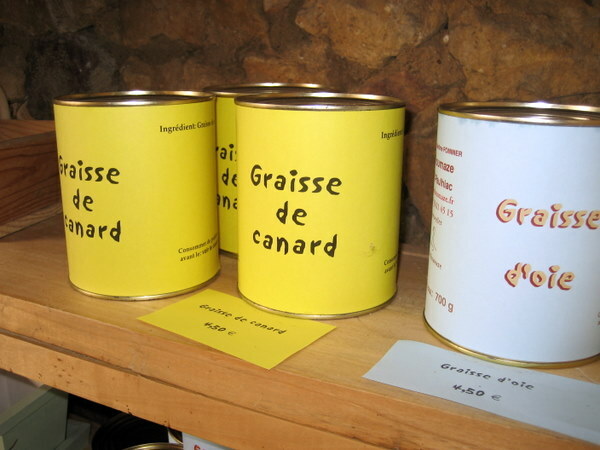 “La gaveuse” means the woman who force-feeds the geese, or a geese/foie gras farmer, traditionally women’s work. The word comes from “gavage,” which is the process of force-feeding the geese. La gaveuse explained the entire process of raising the geese, force-feeding the geese (gavage) to enlarge their livers, and slaughtering the geese to make all manner of geese food products. We didn’t get to see any force-feeding because she does not start that process until September. There are places that are force-feeding now, in the summer months, but she prefers not to do that because that is “agribusiness” and she is doing things in the old-fashioned way (les autrefois), like grandma would. In that world, gavage occurs in the fall (fattening them up for the holidays). In short, our gaveuse was completely awesome. I wish I had been able to understand more of her tour, but it was all too overwhelmingly fantastic, what with the geese, the farm, the foie gras, etc. Died and gone to heaven! Also there were just a lot of words in French that I’d never been exposed to. The Man asked me if there are any politics around foie gras in France. I don’t think so. 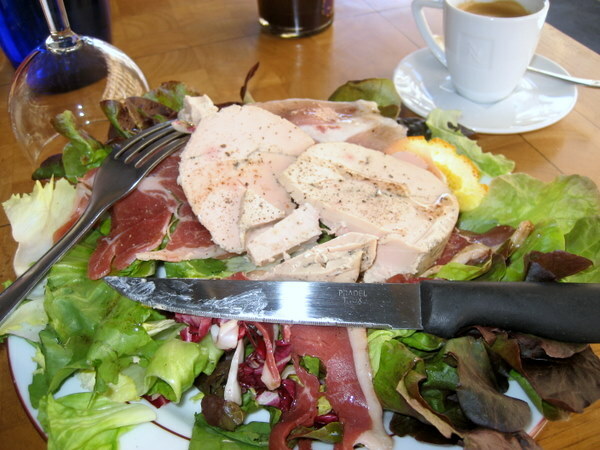 I never heard anyone mention anything about that and foie gras is everywhere in this part of France. It’s one of their traditional food products. To suggest that they shouldn’t make it would be like telling Americans they can’t make hot dogs anymore. I understand now the difference between the small gavage operation like what I saw and the bigger agribusiness operations that GB has visited. To say that people could not raise geese using gavage on a small scale would be a bit extreme to me, now that I’ve seen the actual machine, the farm, the woman who does the gavage, and the geese. It did not look cruel to me, at least no more cruel than what we do to chickens and cows to eat them. 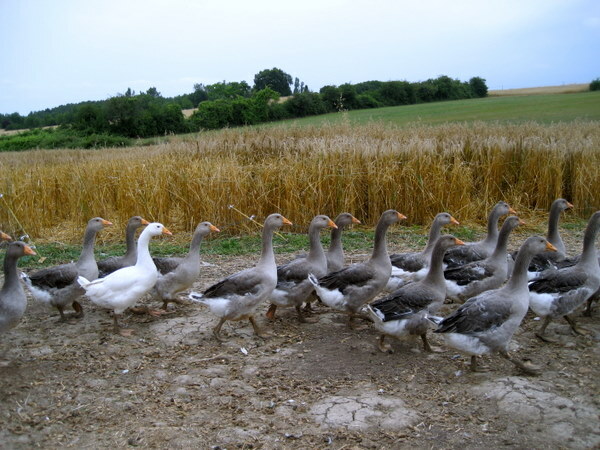 La gaveuse had a relationship with the geese that suggested the gavage was done as humanely and quickly as possible. Also, it’s not like they fatten up the geese, cut out their livers, and throw the rest to the dog. They use every part of the animal for other products, as it should be. 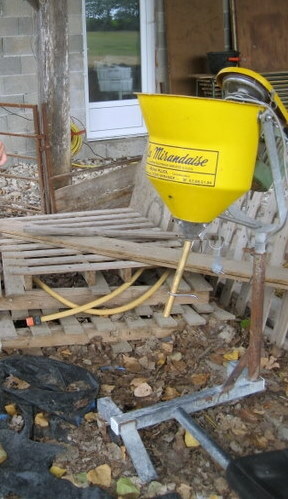 This is the contraption used for gavage. Note the pipe that goes down the throat. 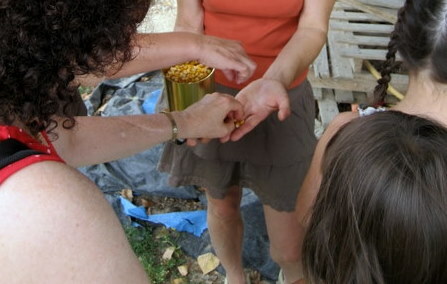 This is the corn mash that is fed to the geese. 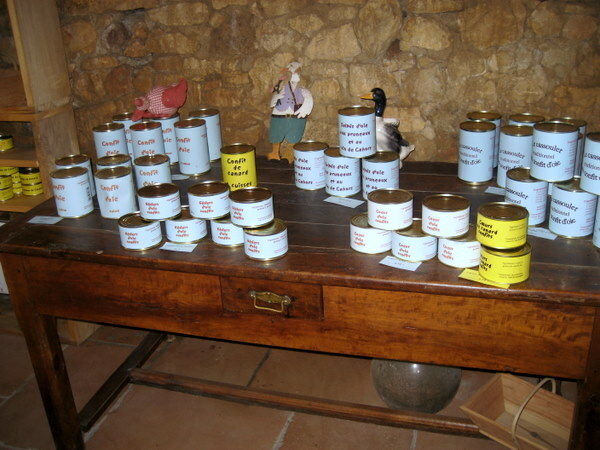 Foie gras shop at the farm. Duck grease in a can. MMMMM! One of the best things I ate there. 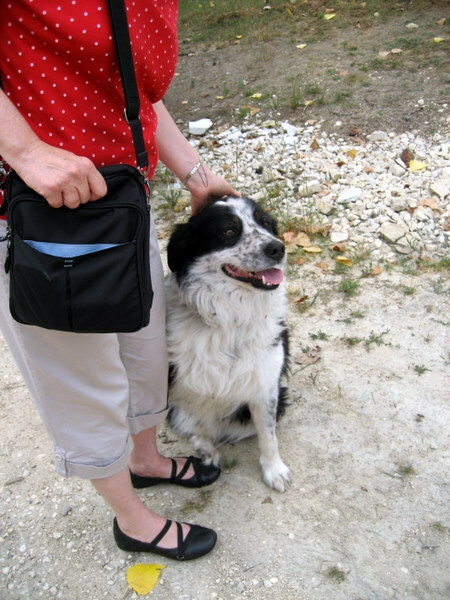 The tripod border collie, now retired from geese-herding service.